Undressed brunette 18 Inch Doll Named "Catherine". Catherine comes dressed in underwear only. Outfits sold separately. DOLL & UNDERWEAR ONLY - OUTFITS NOT INCLUDED. 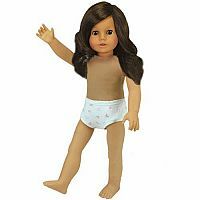 18 inch doll "catherine" brunette with wigged hair & blinking brown eyes. 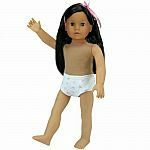 Vinyl doll with soft body and movable arms and legs with french manicure. 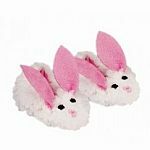 Measures approximately: 20.00 x 9.00 x 5.00 inches..